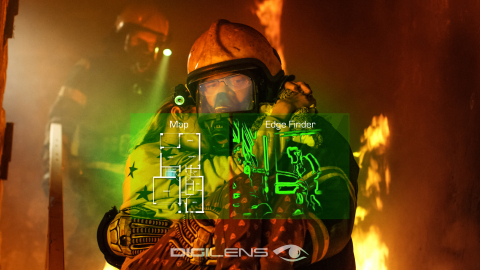 LAS VEGAS--(BUSINESS WIRE)--CES 2019 — DigiLens Inc., the Silicon Valley-based startup revolutionizing smartglass optics for augmented reality (AR) applications, today unveiled DigiLens Crystal, a reference platform that gives OEM’s a customizable, cost-effective waveguide-based eyeglass style solution for both workforce and consumer applications. 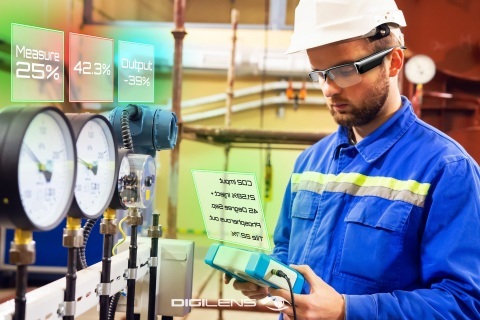 By using completely transparent AR glasses that deliver content both indoors and outdoors, workers in logistics, manufacturing or maintenance functions gain in productivity and safety by getting timely access to real-time remote assistance and enterprise data—all while staying hands-free. For consumers, DigiLens’ smartglass technology enables a rich opportunity for future social, educational and gaming applications. Current first-generation AR smartglasses are tinted like sunglasses to compensate for the low efficiency and dim displays, which are undesirable to most for social interaction. Also, due to their integrated Android processor and battery, they are heavy to wear, expensive and have limited battery life. They provide the same experience of buying a cellphone and wearing it on your head. DigiLens Crystal makes use of the USB-C power outlet common to many smartphones, greatly simplifying the AR glass solution to just the glasses. Owing to unimpaired transparency, the DigiLens display is there when you need it and gone when you don’t. From the outside, they look just like clear glasses, but from the user’s point of view, the display is so efficient it can be used on a bright sunny day. DigiLens optics are manufactured from a proprietary photopolymer and low-cost holographic contact copy manufacturing process. Because of this breakthrough technology, the AR glasses will retail at a true consumer price point below $499. Due to the higher optical efficiency, DigiLens Crystal can last over five hours connected to a smartphone, or up to fifteen hours with a portable power bank. Almost identical to the 30-degree field of view AR display in the Microsoft HoloLens, DigiLens’ smartglass-based reference design sports an eight-megapixel camera and weighs just under a half pound. DigiLens has created strong partnerships to develop a complete supply chain for OEM’s, including licensed waveguide manufacturer Young Optics of Taiwan, ODM and electronics supplier Malata of China, pico display manufacturer Sekonix of Korea, whose modules leverage Texas Instruments DLP® Pico™ products.